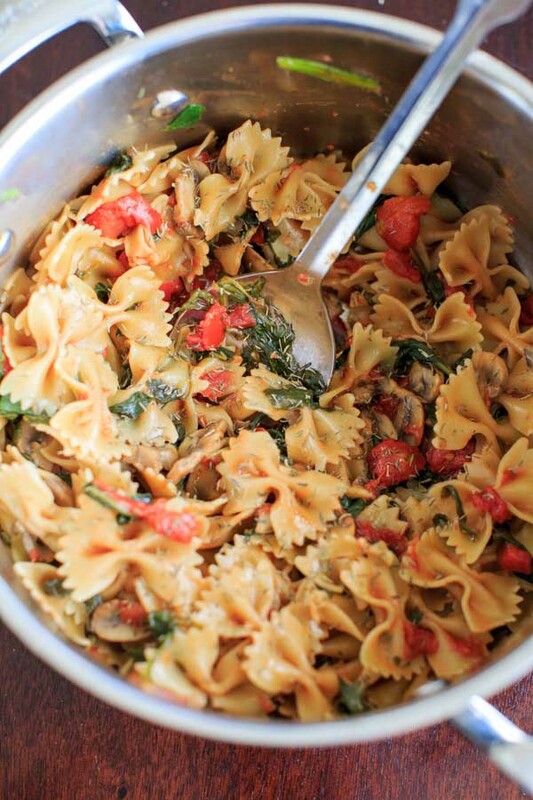 One Pot Spinach and Mushroom Bowtie Pasta. Vegan meal ready in less than 30 minutes! Sometimes I have so many things I’d like to cook, but the thought of doing dishes afterwards stops me from cooking anything. Does anyone else have that problem? If I had a full-time dish-washer maybe that would help. But until that happens, I’m going to start to post more one-pot meals on here. 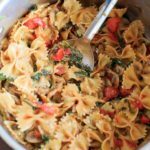 I was a little skeptical of one-pot pasta meals, because I wasn’t sure how the pasta would be fully cooked. As long as you have enough liquid/steam it works just fine! 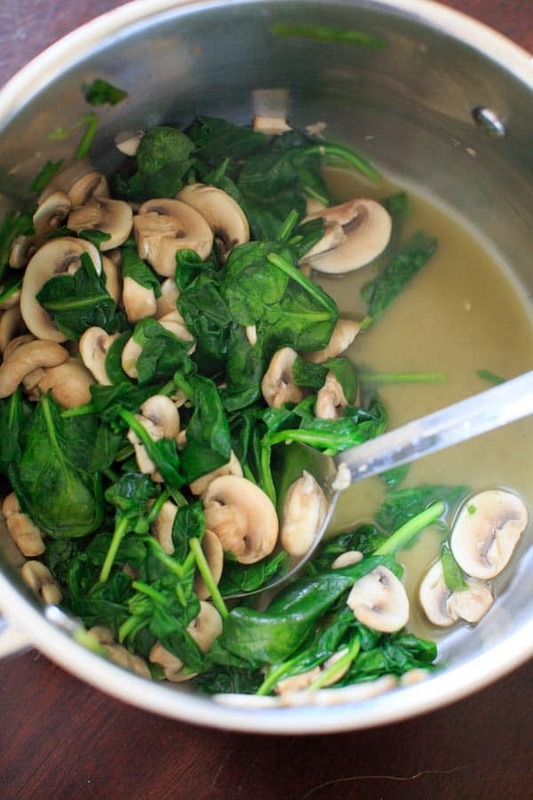 I had plenty of mushrooms and spinach on hand, which is why I chose those veggies for the dish. But you can use a variety of veggies to suit your preferences. Remember that spinach cooks down a TON so you can always add more. Just saute the veggies in a little bit of oil (I used coconut oil), then add pasta, water and diced tomatoes to the same pot. After cooking I like to add a little olive oil so it’s not as dry. Top off with seasonings and some salt and you have dinner! As with most of the recipes on this site, you can adjust things to your preference. Veggies and spices are awaiting your creativity. I preferred the pasta with Italian Seasoning but also enjoyed it with thyme. You might want to sprinkle a little additional on each serving to make sure everybody gets some! In a large pot, heat oil over medium-high heat. Add sliced mushrooms and stir until softened for a few minutes. Add 1/2 cup of water and the spinach and stir until cooked down, about 5 minutes. Add pasta, diced tomatoes, and remaining water. Let boil until pasta is cooked, about 10 minutes, stirring frequently. Remove from heat, drizzle with olive oil if using. Add seasoning and salt to taste. 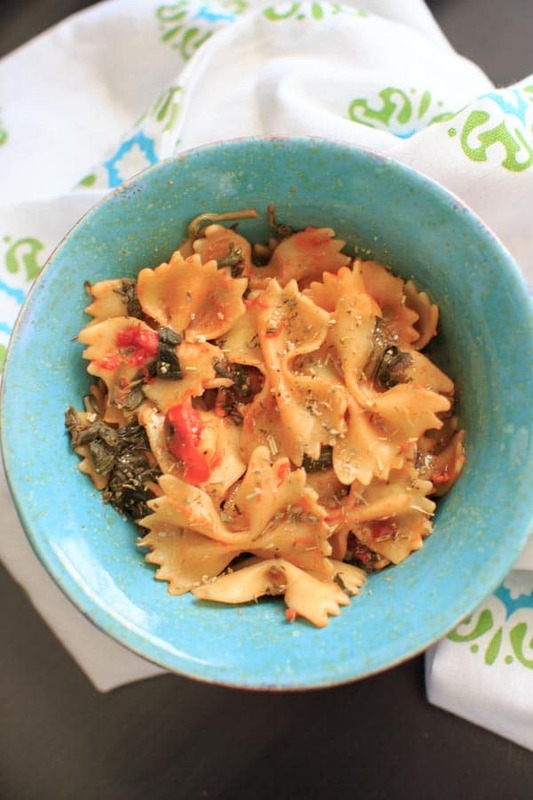 Love bowtie pasta and the combo of spinach and mushroom is super yummy. 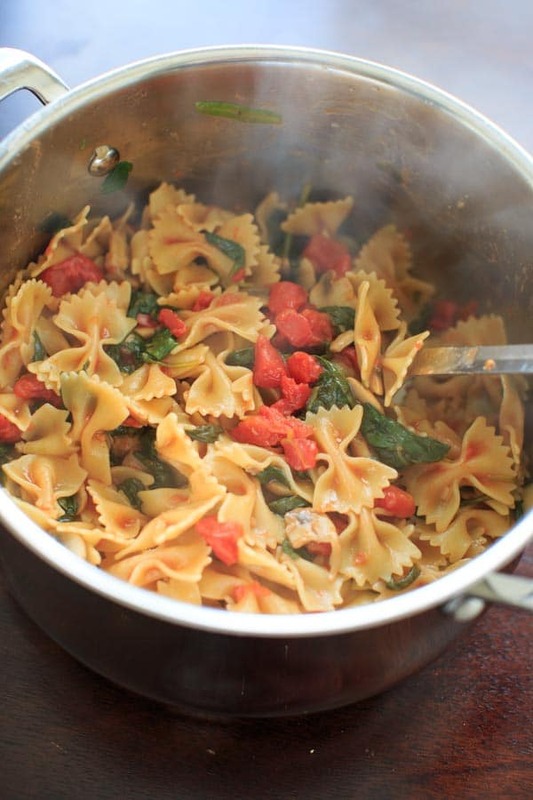 Such a great quick weeknight recipe! I know what you mean about the clean up. I spend half of my cooking time cleaning up so i don’t have to after I eat! This looks delicious another one pot meal to add to my list! I tried this tonight and it tasted of flour. Probably from cooking the pasta in the same pot as the sauce and not rinsing it. Next time I will makes it a two pot meal and cook and rinse the pasta before adding. Could do with a touch of tomato paste. I don’t see any mention of flour in this recipe. The flour taste is from not enough salt you need to remember that when you are cooking pasta you’re salting the water. This was great but I added garlic, lemon juice (half) and onions to the spinach and mushrooms. Cooked in the olive oil and put all the liquid at the end.